Star Wars miniatures from Wizards of the Coast was a huge success for years. Sadly they've decided not to renew the license, and that product range has now ended. Those were pre-painted, and were plastic. 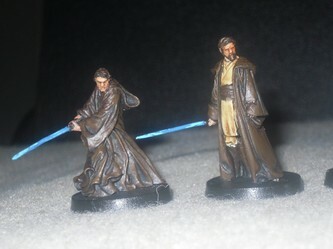 What miniature enthusiasts have wanted for years now are metal unpainted Star Wars miniatures, that we can paint ourselves. 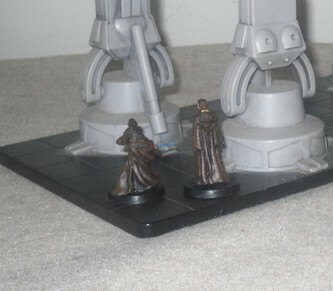 The last time a pewter miniature was even cast for Star Wars, was available in the form of Darth Maul and Qui-Gon-Gin from the ill fated Duels board game around the time that Episode I had been just released. Those were quite nice actually. Before that, all we had was the line made by West End Games from '89-'99. 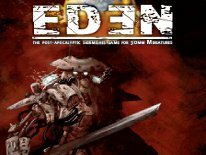 At the time it was a nice range, and it had a wide variety of miniatures to compliment the roleplaying game sold by West End Games as well. The scale was about 25mm. I haven't seen these in years, but I do recall they seemed a little smaller than any other minis of the time. They could have even been a hair smaller. Nonetheless, it's been over a decade since the market has seen unpainted Star Wars miniatures. Along comes Knight Models. It wasn't very long ago that they first appeared on the scene with fully licensed Limited Edition Marvel Comics models in the 70mm scale. Next they took on the Star Wars license, and obtained it to make Limited Edition 70mm Star Wars models. 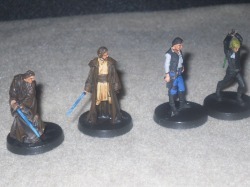 Now they've released an Unlimited Edition of 30mm Star Wars figures. As soon as I heard about these I contacted them ASAP to try and get my hands on them to review. So here today I have all four of the first releases to cover in-detail. The first piece we'll talk about is the Anakin Skywalker model. This model is three pieces. The body was mostly a single cast piece, with a separate head and light-saber body to glue on. Assembly and clean up was quite nice. I found only minimal mold lines, and no flash at all. The head needed the slightest bit of filing to get it to fit proper on the body, but it wasn't a big deal. It took all of 2 minutes to get it to fit snug, if that long. The light-saber is cut at the end where it connects to the hilt on an angle, and on the hilt it's cut at an angle too, so that both pieces fit together nicely, and it forms a little better than the average bond. With this being such a tiny piece, I was worried that even with this well thought out design, that I'd still need to pin it, or replace it with brass rod altogether. Surprisingly this was one of the models I had absolutely no problem with, when it comes to the saber staying put once bonded to the model. My guess is that the special cuts utilized by this design works just like it was supposed too. Visually this is a very striking pose. This is Anakin from the Clone Wars, or Episode III time frame, because he visually has that scar on the right-side of his face, which only appears after Episode II: Attack of the Clones. Of all the pieces, I'd have to say this is the only one to not look as much like the actual movie actor who played the character, but more like Anakin Skywalker from the Clone Wars cartoon series, only not a cartoon version if that makes any sense? The figure definitely looks the part though. He looks wicked pissed off, and is poised to strike with saber blazing in-hand. The robes are flowing, and ever so elegant. If you look closely, you can even see that the saber hilt is authentic, right down to the button to turn it on and off. That's the kind of detail you can find on every one of these models. The only thing disappointing about any of these models is that they include the cheap, and uninspiring 25mm slotted bases, instead of the nicer 30mm lipped display type bases. The Obi Wan Kenobi model is really a gem too. 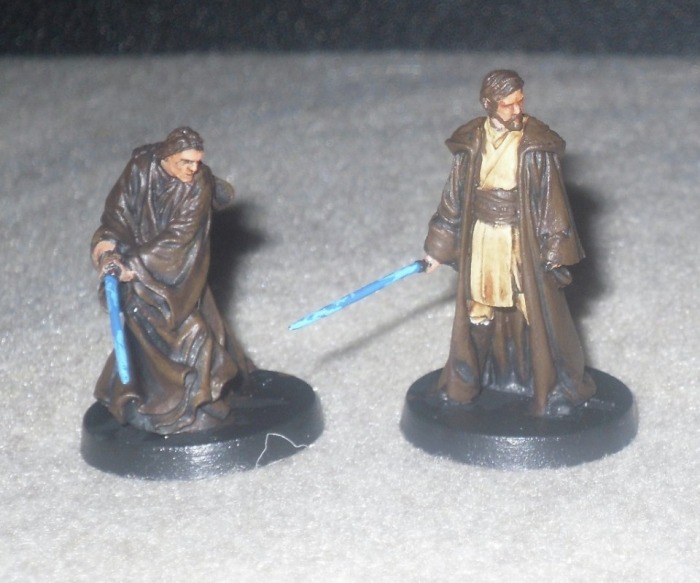 The likeness of a middle-aged Obi Wan has been captured so flawlessly in this model. This is also a Clone Wars/Episode III era version of the character, as he's bearded and is slightly older than the newly bearded Obi Wan found in Episode II. The serious facial expression is impressive. The model stands with saber drawn, and looks like he's about ready to take on Anakin in the climactic duel of all light-saber duels near the end of Episode III. The belts, robes, saber... it's all authentic in presentation too. Truly impressive stuff. Assembly and clean up also wasn't a big deal. Actually it was quite simple. 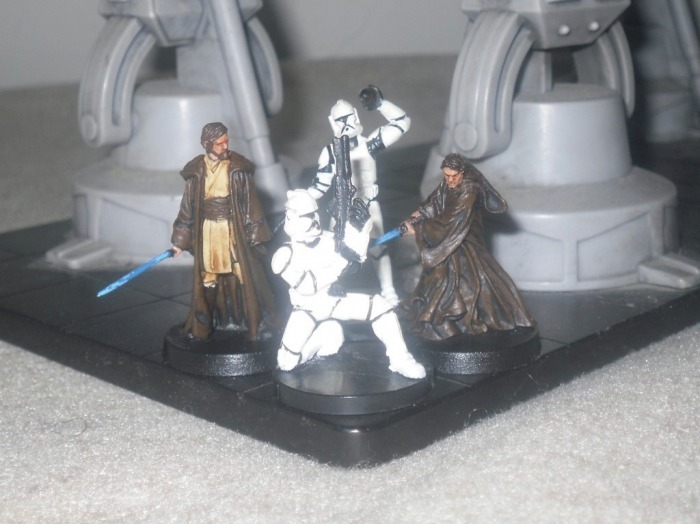 This was a two piece model, and the only thing I had to glue was the hand with light-saber molded into it, to the body, and then the figure to the base. Therefore it's pretty much a single mold design, with the right-hand w/saber being separate. There was a tiny hole up in the robe sleeve wrist area made for the hand w/saber to bond to, and the hand had a tiny nib sticking out, but I didn't want to take any chances. It didn't fit snug at first. To be safe I bored into the wrist a little with my pin-vice, before gluing, and then into the hand, and then pinned the pieces with a tiny piece of brass rod. The method they employ probably would have worked fine had I taken my time, but when it comes to small parts, if I can pin them, and it makes sense to do so, I just do it to be safe. This way if later I bump it, or nudge it too hard, chances are it won't break free since I pinned it in place. Nothing ruins a paint job more than when you break a piece off by accident, and it pulls more paint from the piece than it was supposed too. So I'm just extra careful. Having said that, my only true complaint would be that they included such an average, and uninspiring 25mm slotted base, for such a nice figure. Luke Skywalker is depicted in his Jedi Knight form, ripped right from the duel with his father Darth Vader from Episode 6: Return of the Jedi aboard the Death Star. He's depicted with his saber drawn, walking confidently forward, taking large and deep cuts with his saber, with extreme over the head two-handed swings. This is Luke Skywalker at his finest and most defining moment as the saga draws to a close. This depicts the boy who has become a man, and is now a fully fledged Jedi Knight. Once again, I'm very impressed by the level of facial detail. My paint jobs I think are quite nice, but they don't do the figure justice, because I'm not a Golden Demon-quality painter. The Knight Models studio painted photos really bring out the authenticity in the facial detail of all of these sculpts, better than mine do. Nonetheless, Luke Skywalker looks serious, and if you don't obscure the detail during priming, you won't have a hard time seeing that this looks just like Mark Hamill. This was also a mostly one piece casting, with the exception of the two hands holding the hilt, and light saber pieces came separate. The hilt is authentic looking too. The hands fit very well, and went into place without a hitch. The saber tho was a little more problematic. The hilt looks to be bored into a little, so it's designed so that the saber body sets down inside the hilt a little. However there was not enough of a bit sticking out on the end that needed bonded to the hilt, to make a strong enough bond. I had nothing but trouble getting that saber to stay glued in place. I ended up just replacing it altogether with some thin brass rod that I use for pinning models. Actually I think the end result looks a even better, as I cut the rod a hair longer than the saber they had included. Others might have better luck with the saber than I did, but I kept breaking it off during painting, and I guess it would probably have been fine to glue it on last, but even then, if you bumped it the slightest bit it would have broke free. I used my pin-vice to bore into the hilt a little more, so that the rod went up into the hilt deeper, making for a much more secure bond. That saber isn't going anywhere now. Like the others this piece also included a 25mm slotted base. I saved the best for last. I feel their Han Solo figure, is truly the most amazing figure of the entire line thus far. Never have I seen a more authentic depiction of a young Harrison Ford anywhere else. I've seen some really amazing larger scale action figures, and quite a few statues and busts depicting a young Ford as Han solo and Indiana Jones both, but the sculptor of this piece did one better than everyone else to have tried before him to capture a young Ford. This is Ford in his finest hour, as this looks too be Han Solo from Episode 4: A new Hope, which appears to be right about the time , in which he blasts Greedo in the Cantina. It doesn't matter who shot first, the fact remains, this is the very best sculpting of Harrison Ford as Han Solo ever. This was totally a single piece model too. There was nothing to glue, aside from the figure to the 25mm slotted base. Cleanup and assembly was also a piece of cake. The little details like his blaster, the stripe going up the side of his paints, and all of the intricate details found on the vest, it's all there. This isn't just an amazing sculpt of Harrison Ford as Han Solo, this is an authentic sculpt of Han Solo from the very first Star Wars motion picture as well. It doesn't get much better than this. I have to admit, I am somewhat of a Star Wars fanboy, but not the point that I don't like Star Trek and other established Sci-Fi properties either. I'm definitely not as bad as the guys in that movie called Fanboys. lol Therefore I am a little biased when it comes to Star Wars, and a little more passionate about the subject than most. However, I really don't think there are too many men in gaming, who are my age (almost 40), or close to it, who didn't grow up with Star Wars having a huge impact on their lives, and who don't enjoy the entire mythos surrounding it. Therefore I'll make that clear first and foremost. Having said that, even if I were not a Star Wars fan, these are still very amazing, and very detailed sci-fi models just the same. What's more, it's totally clear who these are marketed at too though. If you didn't like Star Wars, chances are you'd never give these models the time of day, therefore my Star Wars bias, is irrelevant. Price-wise I've seen these starting to hit North American retailers over the past couple of weeks now, and on average they've been priced at $20 USD. You can order direct from Knight Models website, but unless you're in Spain, or a region somewhat near there, then and only then is it worth buying direct. Otherwise you're better off buying them from a retailer closer to your own specific region, to save on shipping costs, and to cut down delivery time. Direct from Knight Models and in most of Europe you're looking at 15 Euros each per model. 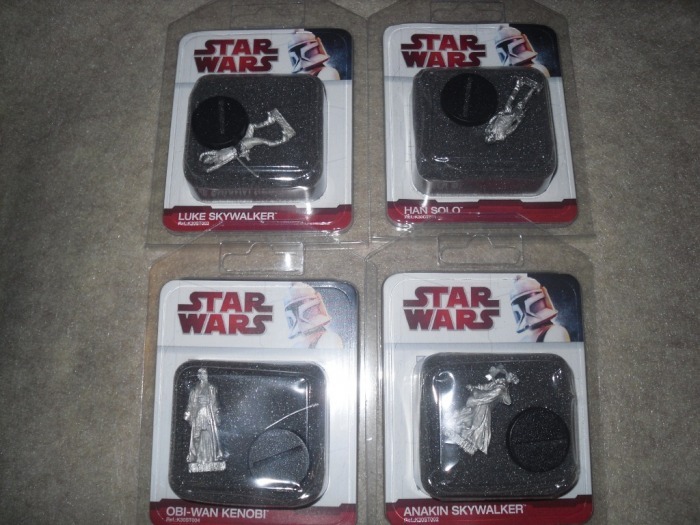 Granted this is a little expensive, but then again, you have to realize that these are fully licensed Star Wars products, and in all fairness, they did do a superb job on each and every one of the 30mm models so far. We also pay $15-$20 for a single metal GamesWorkshop model without blinking, so $20 for an amazing Star Wars model, I think, is worth every penny. These are truly more a model, than they are average metal gaming pieces too. These are definitely models designed more too be collectors pieces, than a piece you will handle day in day out gaming, but nothing says you can't use them for gaming. To the contrary, I think these are the best thing ever to happen to miniature gaming, because we've wanted models like these, which are authentically detailed, and that we can paint for years now. 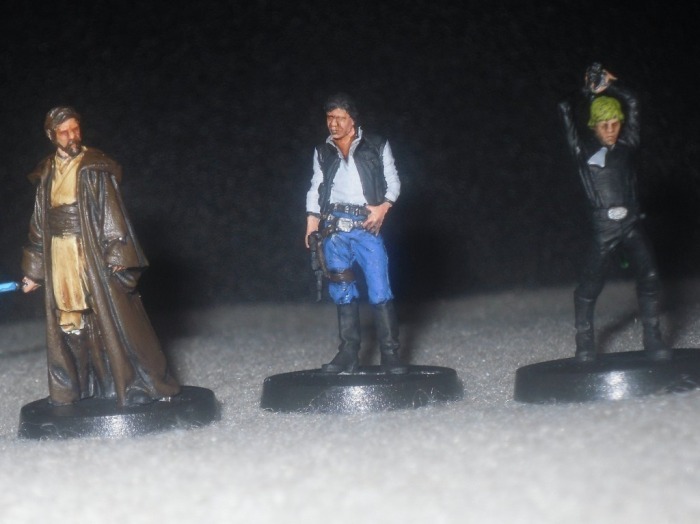 I will also say, that all of these models seem very painter-friendly too, because they're amazingly detailed, but the thing is, almost everyone who would be buying these, has no doubt seen Star Wars multiple times. Therefore when it comes time to sit down and paint these, there's very little need to refer to photos and such for reference. Most gamers are already so familiar with the characters, that we can pick out what this, or that may be. These aren't over complicated to the point that you can't distinguish just “what is that” and “what color should I paint what ever that is” too. There's not so much going on, that all of the details are distracting, but there's no lack of authenticity and detail just the same. These for me, were some of the most fun models to paint, that I've put a brush to in years. These make me want to be a better painter, because they are so well done, that I don't want to accept anything less than the very best I can do. So the pictures of the models I painted for this review, are only about 80%-90% complete. I'll probably take a lot more time picking out more of the detail, shading and making these pop even more over the next few months. I'm in no hurry either. I do have a tip too. Over the past few months I have started to use a black brush on primer from Reaper's Pro Paint line, which I only use on special models. I save it for models that I want to retain all of the original detail on, more than most. I'd suggest using this primer for showcase, and special character pieces like these, not for painting an army. This black brush on primer, allows me to control how thick the primer goes on, so I don't obscure any details accidentally, which can, and has occurred many times in the past with most any aerosol spray on primer. I feel utilizing the brush on primer like this, helps to secure the detail of the models, as the sculptor intended. I think Knight Models has a surefire winner on their hands with this new 30mm range of fully licensed Star Wars models. My only complaint, is that at the price-point which they have to sell these at, they really need to switch up to include a nicer 30mm lipped display base, like those that are included with most every other 30mm scale piece from the competition. The 25mm slotta-bases are just tacky, and it's totally out of place for such nice models. I'm also sad that they don't have a Bobba Fett, Jango Fett, or even a Darth Vader available in this, or the 70mm model line yet. 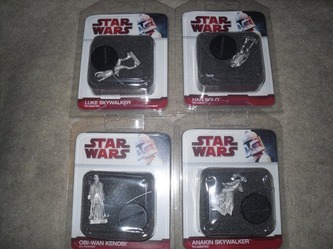 I think most would trade their first-born for a Bobba Fett in 30mm, especially one that's as detailed and nice as these first four models are, myself included! The good news is that none of the gripes I have, couldn't be remedied over time. 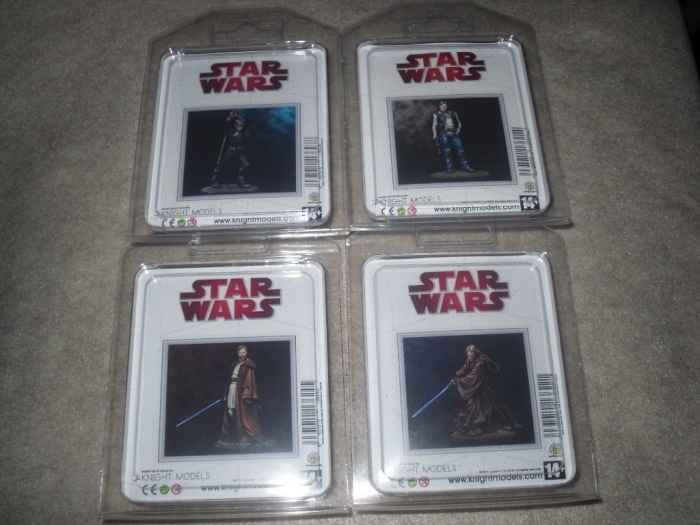 As it stands, no where else can you get Star Wars models this nice in metal, and in 30mm scale. This line can't fail, because the demand for models just like these has existed for over a decade. The wait for many is over now, thanks to Knight Models. The only challenge they have at this point, is that they've set the bar so high now with the initial release, that it remains to be seen yet, if they can keep putting out models of this caliber. Although one could say that the 70mm Marvel Comics LE, and 70mm Star Wars LE lines may be good examples of what they're capable of in terms of consistency, so I'd say the future is definitely bright. WarGameGuru - Can you fill us in on how Knight Models originated? Knight Models - The core of Knight Models (that is Jose Caballero Delso and Jorge Alborch) met when working at Andrea Miniatures, the most important miniatures’ company in Spain at the time. They became friends and started dreaming about doing things in a different, improved way by manufacturing only in Europe, paying the utmost attention to quality, and offering something different and exclusive. Of course, they also had into account the type of models they would really like to paint and collect, as they themselves had been “in the hobby” ever since kids. Their years at Andrea granted them the necessary experience and contacts to start something on their own. The team was later completed with family and some more friends. We are a small but ambitious company :-). on Marvel comics, and StarWars properties. How hard was it to obtain the licenses for StarWars, and Marvel comics characters, and was one harder, or more costly than the other? Knight Models - The project was carefully thought and developed before it was presented to both companies. They loved it since the beginning because they understood that the idea of creating exclusive models of their characters in terms of presentation and in limited editions of 500 units each could be really appealing to collectors in the miniature world. The paper work was long, though, as it always is, and the approval of each model has taken its time, but the idea was accepted right away. Star Wars was harder, because it’s taken us longer. Regarding costs…well, buying a license of these characteristics and such popularity can’t be cheap, as you can imagine. does that process take from when you send them a model, to when you actually get the approval to move ahead with production? 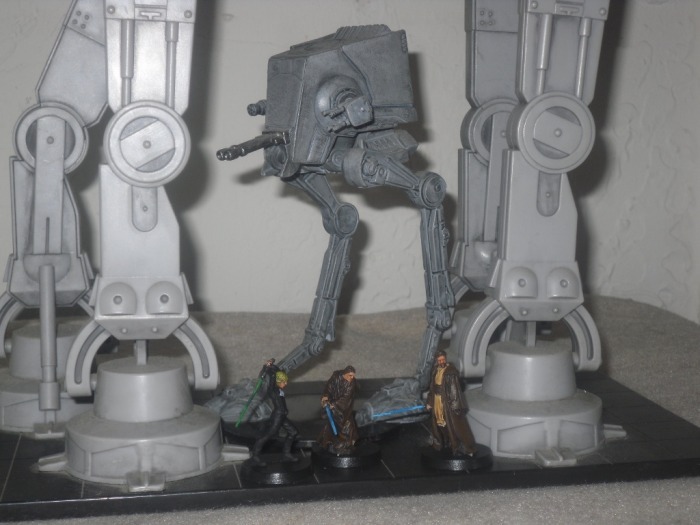 Knight Models - Honestly, we use a middleman with Star Wars, which makes the process necessarily longer than with Marvel. The approval depends on the model: sometimes it takes weeks, other times it takes months. Also, it’s not only the models, but the packaging, the stickers, the characters’ biography cards, the pedestal…so many little things to be approved! If Mr. Lucas had to do it himself, he wouldn’t have time for anything else! Knight Models - Marvel has an even more competent and hard working approvals team. It has always been a pleasure to collaborate directly with them. Every aspect and detail of our product has also to go under their approval process, but they are a team, not a single person. 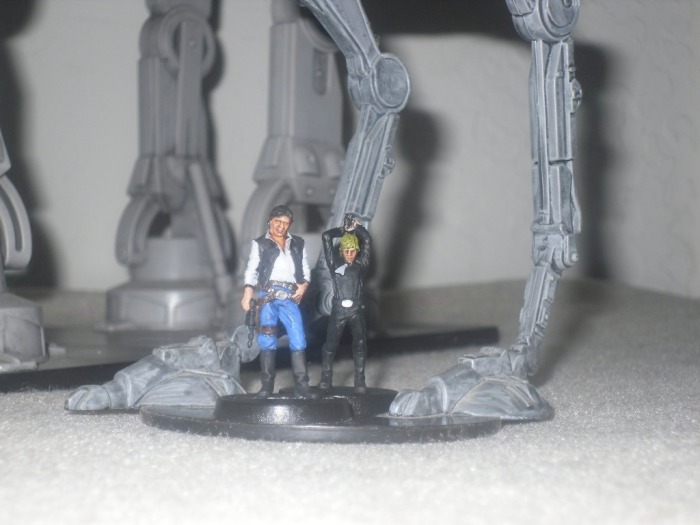 WarGameGuru - Is there room for much profit once you have paid the licensing fees, because I've heard that the Star Wars license alone can be very costly? Knight Models - You are right: these licenses are quite costly. Also, we are a very young company, not even two years old, so we are still making our way into the market. We know now is the time to work hard, to learn, improve and consolidate. We have faith in our products, and expect them to succeed…but no, we aren’t rich yet :-). for excellent miniature sculpting and painting talent. With that being the case, was it hard for you to find the right people to sculpt both of your model lines? Knight Models - It hasn’t been hard at all. As aforementioned, the core of Knight Models has been a part of the miniature world for decades (they are still in their thirties, but were quite precocious! ), firstly as fans, later as professionals. Most of the people who model or paint for us have been co-workers at other companies and are actually our friends. your studio display models, and where do you even begin to find someone of that caliber? Knight Models - Between beers…. :-) just joking. It’s actually Alfonso Giraldés. As we said before, we knew our painters and their work before we asked them to collaborate with us, they are mates and we enjoy working together and understand each other really well. which are two of the most iconic figures of the entire movie sagas. Are there plans for Boba Fett and Darth Vader, and why weren't they two of the first figures to be sculpted and offered based on their popularity alone? Knight Models - We are afraid it’s just a matter of personal taste…after all, it’s our company! :-) Actually, we believe it’s a good thing people are asking this question themselves: a bit of expectation is always a good marketing. But don’t you worry; we are working on both at the moment and expect to have them soon. WarGameGuru - So what other models will be next to being produced in the StarWars and Marvel product lines, and how long do you hold those licenses? Knight Models - Well, we have already said too much on that…you will have to check our web periodically! The licenses in both cases are two years long, but we don’t think it would be a problem to renew them, as long as we have the money. 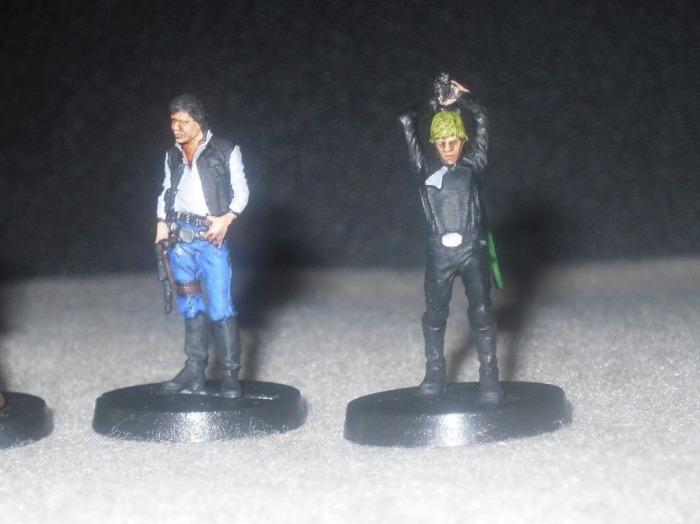 WarGameGuru - With the success of the Marvel and StarWars lines, will you be branching out into taking on creating any other licensed property model ranges in the future? Knight Models - If that happens, it would be in the long term. Right now, there are so many Marvel and Star Wars characters we’ll like to do. Remember we haven’t even released Darth Vader yet! There’s still a lot we want to do with these licenses. WarGameGuru - I guess it wouldn't be too hard to create your own model line, if you wanted to, since you have already pulled together the proper talents to have created the existing ones. Is there the chance that Knight Models will create their own models in the future, if so what genre would you base them on sci-fi, fantasy, historical, WWII, etc? Knight Models - To create our own model line would be another dream come true. Of course we consider it, but not in a near future. We’ll probably stick to sci-fi and fantasy. There is a huge offer of historical and WWII kits in the market. WarGameGuru - Is there anything else that you'd like to share with WarGameGuru on the topic of Knight Models that we didn't cover? Knight Models - Uhmmmm….not really. That was pretty thorough. Thanks a lot, Rod.